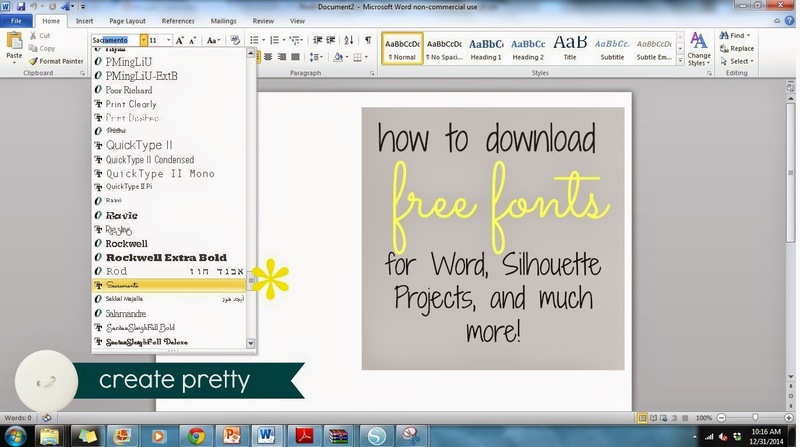 Ever wonder how to download cute, FREE fonts to steer away from the boring, typical preloaded fonts? Look no further! I actually downloaded fonts in college (over 8 years ago). I was a teacher ed major and fonts made everything cuter. Every computer is different so even though I learned how to do it on a dinosaur of a computer, I have retaught myself on our newer computer. Even though there are a few steps in this tutorial, once you do it a few times it becomes second nature. 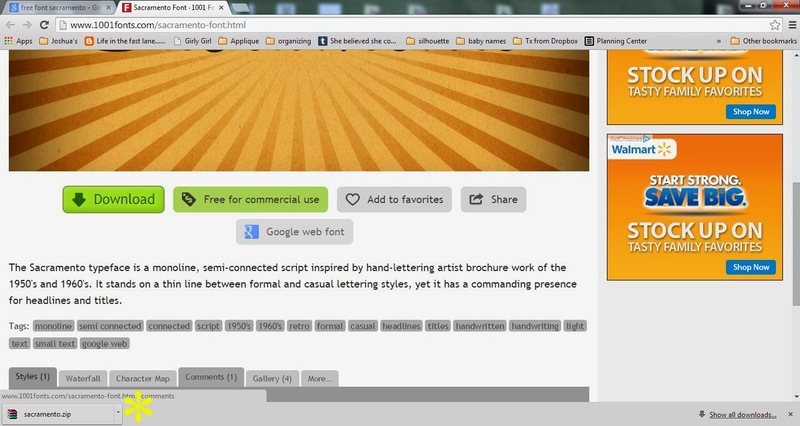 First, search for your font... there are TONS of pins on Pinterest with names and samples of fonts. That's where I usually start. I have been in love with this font "Sacramento" for a while so I was ready to add it to my collection. I originally found it on Picmonkey.com. I really wanted to import it as a ttf (true type font) so I can use it in Word, Powerpoint, and Silhouette Studio. I used the first entry that came up in google. I have used 1001fonts before so I knew it was legit. Dafont.com is also a great source. After clicking the link, scroll down and click DOWNLOAD. On my browser (Chrome on a PC) a box immediately appears at the bottom of the screen labeled with the font name. Because my embroidery machine and silhouette are set up on my PC I use it for all my printables, silhouette projects, and graphics for the blog. I use my Mac laptop for everything else but I have never downloaded fonts on it. I'm sure it's a fairly similar process. As it downloads, locate your font folder. If you've never done this before, you may not even know it exists. Open any folder (or go to the start button>computer) and locate the Computer file on the left side. To narrow the search even more I click the OS(C:) file. Because I have SO MANY embroidery fonts downloaded (which are completely different from true type fonts), searching just the computer yielded THOUSANDS of results. So by clicking the OS(C:) I eliminated all those files. Use the search bar on the top right side and type "font". It will help you locate your font folder. For me the font folder was the first file that came up after I clicked enter. Everything under it are the individual fonts within that folder. 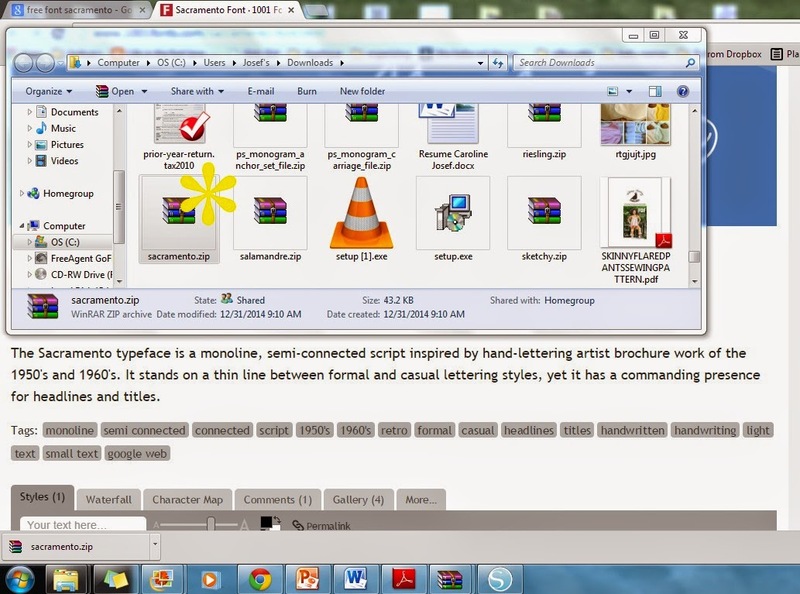 Open the font folder by double clicking. By now the font should be done downloading so click back to the Chrome browser. 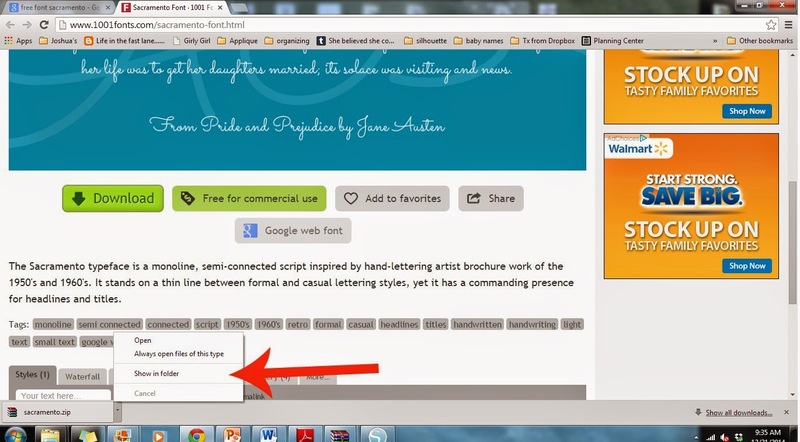 Click the arrow next to the downloaded font and click "show in folder". 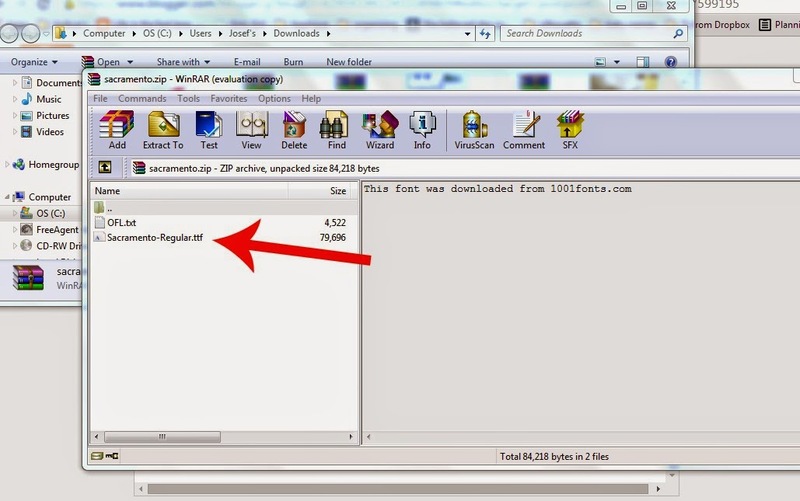 What this does is located that file in the "downloads" folder, essentially saving you a step. A new folder will pop up (with probably many downloads that you've forgotten about). Double click the "Sacramento" zip file (that looks like a pile of books). This screen will pop up. If another screen pops up on top- don't be alarmed. Just click "close". 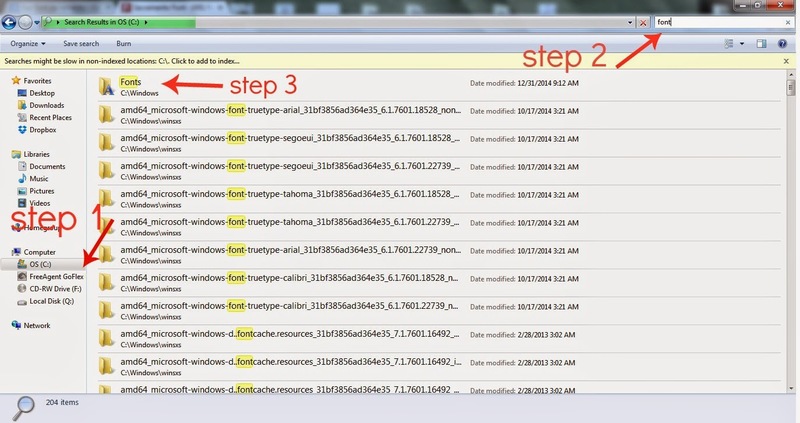 These are the files contained within the zip. You want the .tff (which is the Sacramento true type font). Be sure you can see the font folder we pulled up a while ago. If you can't- locate it, then click back to this screen. If you can't find this exact screen, go back to downloads, locate the file and double click again. Click, drag and drop this file into your font folder. It will automatically alphabatize the font so don't be alarmed if you don't see it move. Simply scroll down to the "s" section or search at the top "Sacramento". 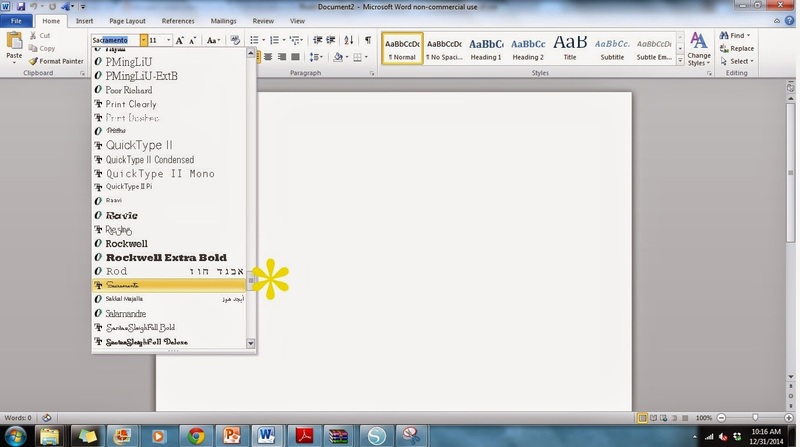 And just to prove it worked... open a Word document and search for your new font!